Shipping is clearly marked in your cart. Currently only $3 per order. Order $20 or more, and get FREE SHIPPING. International shipping is not refundable should it not arrive, and tracking indicates it left the United States. You can use any major credit card, or PayPal. Your information is safe and secure. Our credit card process is compliant with the best practices. Sales Tax is collected for Texas deliveries.  There is a limited warranty on this product.  30 Day Money Back Guarantee. You Must Be Happy.  Please contact us to arrange for the return, replacement, or refund.  We cannot guarantee against loss of your glasses or damage to electronics or clothing. We value your privacy, and will not sell or otherwise make available your contact or payment information. We may contact you from time to time with special offers, new products, or news, and of course, you can always ask to be removed from any future mailings. You say it's strong. Tell me more. 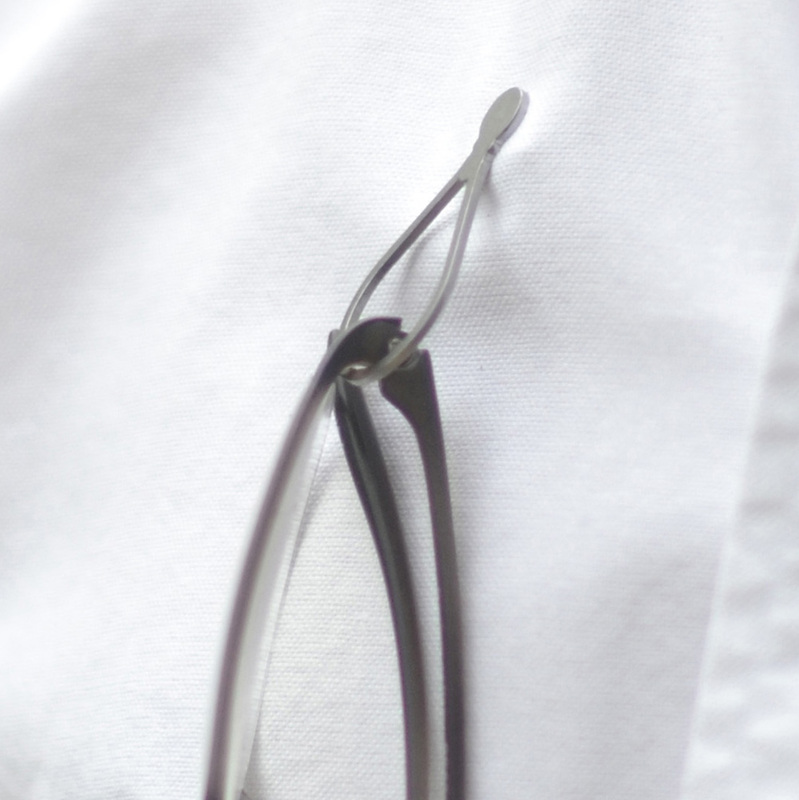 Our patented eyeglass holders use a novel approach. The original Steel-0 will support over two pounds. The other versions hold various weights. Much more than glasses. Place our magnet on the inside of your shirt, and attach the holder on the outside, with the loop down. Hang your glasses in the loop, or attach your badge. To remove it, slide the magnet off. What about silk or thin fabric? The Steel-1, Fleur Loop, and Steel-2 are safe for thin fabrics. The Steel-0 and other models may be too strong. If fabric is thick, use a thinner part. Two layers of denim is probably too thick for the Steel-2. What if I lose the magnet? It's probably stuck to something. It will turn up. What if I break the magnet? If you drop the magnet, or let it smash against metals, it can break. It's sort of fragile. If it breaks under normal use, please let us know. What if it ends up in the washing machine? The magnet may stick to the side of your washer on the inside. It could hurt the clothing it's attached to. I found when I'm unloading the wash, it's stuck to the steel inside. I try not to do that. How does it hold my glasses? Hang your glasses on the holder part, and they will be there for you. Jumping around will knock them off of course. During vigorous activity, glasses may fall out. Slide magnet off. It's hard to pull off directly. Clothing may scratch some glasses. Do not wash your glasses holder in the washing machine. Be careful around pacemakers or insulin pumps or medical electronics. Ask your doctor or equipment provider. The small magnet used for the glasses holder is pretty strong, and as such, there are some things to be careful of. Do not let children play with it or eat it. If a child eats it, an emergency room visit may be needed. Magnet is nickel plated. If you have a a nickel allergy, don't use it. You'd know already. Lots of jean buttons contain nickel. Keep several inches away from sensitive electronics, watches, cameras, etc. Note that your tablet computer has several magnets on it's edges, and cause few problems. Magnet will pinch fingers if not careful. Magnet is fragile. If broken, discontinue use. Magnet will damage magnetic strips.